This peak is #2 on the Height List for Jalisco . This peak is #4 in Prominence List for Jalisco . This peak is #1 on the Height List for Colima . 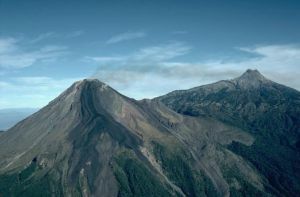 This peak is #1 in Prominence List for Colima .The Colima volcano is one of the most active volcanoes in Mexico. It has erupted at least 40 times since 1576. Recently, eruptions occurred in 1991, 1998-1999, and from 2001 to the present. The biggest recent eruption occurred in January 2015. Six km to the north is a taller volcano, the Nevado de Colima, which is currently inactive and is frequently climbed.